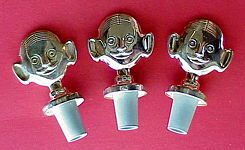 In The Ultimate Corkscrew Book I described this trio as: "No they are not Larry, Moe and Curley Joe. The fellow on the left is the Sommelier and it is Italian designer Aldo Colombo's American Design Patent Number 274,974 of August 7, 1984. In the center is Bacchus. On the right is a Monk Cellarmaster with cellar key hanging from his sash. 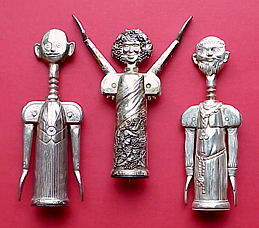 They are all silver plated." 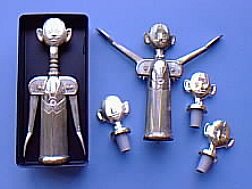 Shortly after the book was submitted to the Publisher, I found that the Sommelier was also sold as a bottle stopper set. 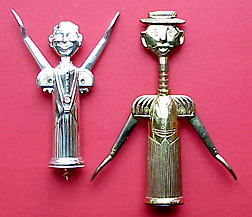 The Sommelier Double Lever turns up frequently on the ebay auction site variously described as "rare" "unique" and "I've never seen this before." And occasionally the novice collector will overpay. The Bacchus figure turns up less often. Third in appearance is the Monk. When I visited Ken Hark's house in Florida, I was quite surprised, to see the fellow on the right. He is marked "Win Young." I have seen him on ebay once (thank you for the trade, Ken). My next surprise was when the fellow on the left turned up on ebay. He's another Sommelier (not marked as such) but smaller than the first. Are there more double levers in this series? June 18, 1999 - Bill Eyres (eyres@montereybay.com) writes "I have the small Sommelier in the box. It is a relatively new product and is called the "Arnold Bottle Opener" and is made by Davco Silver Ltd. in China. The box also says "Silver Open" for some unknown reason. You are right it is completely unmarked." June 29, 1999 - Lloyd Olk (Botlskru@aol.com ) writes "The Sommelier has a brother!! It's a matching bottle opener! It's marked SOMMELIER & ITALY. It's one solid piece with the opener at the bottom & it can stand upright on it's own.